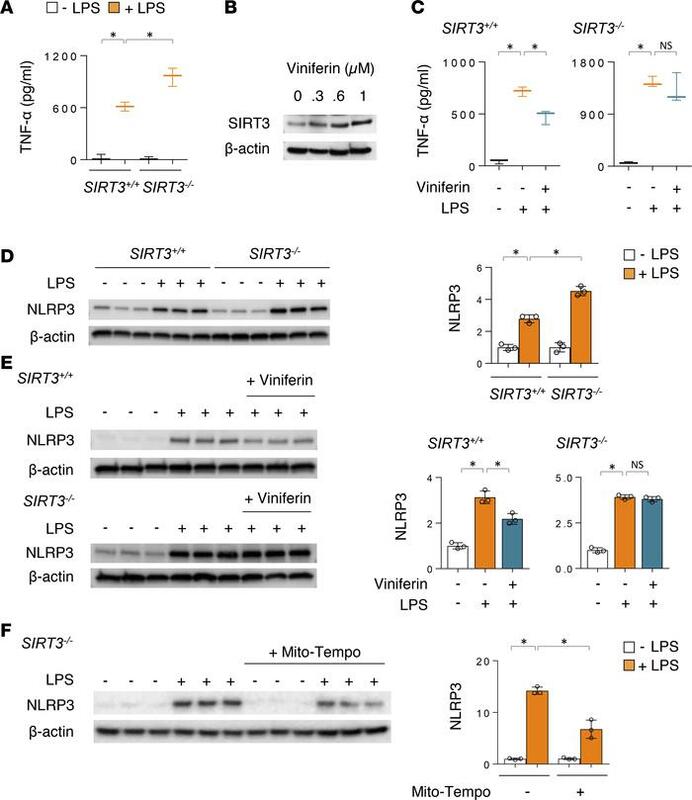 SIRT3 deficiency promotes macrophage proinflammatory activation. (A) Panels show the TNF-α levels in culture media of macrophages (SIRT3+/+ and SIRT3–/–) treated with LPS (0 or 3 ng/ml) for 4 hours. (B) Representative Western blots of SIRT3 and β-actin from macrophages treated with the indicated doses of viniferin for 24 hours. (C) TNF-α was measured in culture media from control, LPS, or LPS- and viniferin-treated macrophages (SIRT3+/+ and SIRT3–/–). (D) Representative Western blots and optical band densitometry of NLRP3 in wild-type and SIRT3-deficient macrophages. Cells were treated with LPS (0 or 3 ng/ml) for 4 hours. (E) Representative NLRP3 immunoblot from macrophages (SIRT3+/+ or SIRT3–/–) treated with LPS alone (3 ng/ml) or pretreated with viniferin (1 μM, 24 hours) and then LPS for 4 hours. (F) Western immunoblots and quantitative analysis of NLRP3 in peritoneal macrophages (SIRT3–/–) pretreated with MitoTEMPO (0 or 50 nM, 18 hours) and then LPS (0 or 3 ng/ml) for an additional 4 hours. Data in A and C–F presented as mean ± SD (n = 3). *P < 0.05 (ANOVA). NS, not significant.